En avril 1957, John Coltrane signe un contrat de deux ans avec Prestige Records. Les séances d’enregistrement du saxophoniste sur ce label furent assez nombreuses. Pour la majorité d’entre elles (certaines étant même plus ou moins informelles), Trane n’est que sideman. Mais c’est chez Prestige qu’il édite ses premiers disques en tant que leader, le label lui autorisant une infidélité, l’enregistrement d’un disque pour Blue Note, le mythique Blue Train. 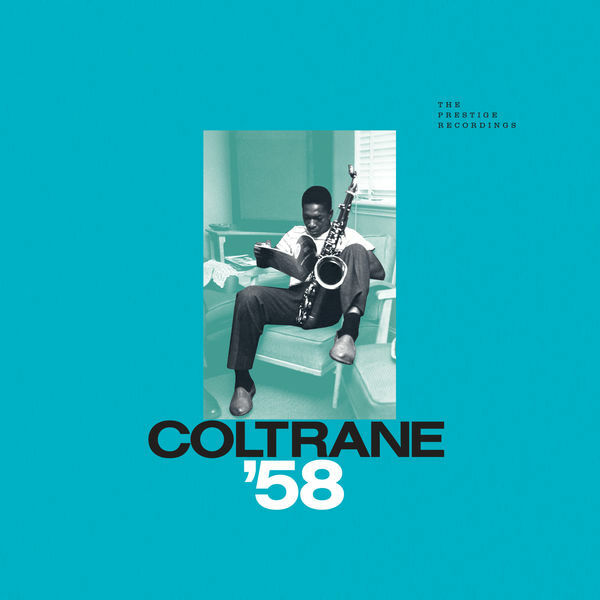 Le coffret Coltrane ’58 – The Prestige Recordings réunit chronologiquement les 37 pièces de l’année 1958 avec le guitariste Kenny Burrell, les trompettistes Donald Byrd, Freddie Hubbard et Wilbur Harden, les pianistes Tommy Flanagan et Red Garland, le contrebassiste Paul Chambers et les batteurs Jimmy Cobb, Louis Hayes et Art Taylor. Ce Coltrane est alors loin d’être un bleu. A 30 ans passés, le saxophoniste se débat avec les drogues mais annonce vouloir faire table rase de ses vilaines manies en signant justement ce nouveau contrat. Son style est en pleine mutation. On est encore loin de la révolution formelle qu’il concevra chez Atlantic et Impulse! et pourtant, accessible et d’une virtuosité toute contrôlée, il possède déjà une sonorité identifiable entre mille. Il y a une urgence dans cette musique qui ne sonne comme aucune autre. John Coltrane, MainArtist - Billy Strayhorn, ComposerLyricist Copyright : ℗ 2016 Concord Music Group, Inc.
Johnny Mercer, ComposerLyricist - Harold Arlen, ComposerLyricist - John Coltrane, MainArtist Copyright : ℗ 2018 Craft Recordings, a division of Concord Music Group, Inc.
John Coltrane, MainArtist - McCoy Tyner, Composer Copyright : ℗ 2018 Craft Recordings, a division of Concord Music Group, Inc.
John Coltrane, MainArtist - Calvin Massey, Composer Copyright : ℗ 2018 Craft Recordings, a division of Concord Music Group, Inc.
Richard Rodgers, ComposerLyricist - Lorenz Hart, ComposerLyricist - John Coltrane, MainArtist Copyright : ℗ 2018 Craft Recordings, a division of Concord Music Group, Inc.
Irving Berlin, ComposerLyricist - John Coltrane, MainArtist - Rudy Van Gelder, Engineer, StudioPersonnel - Bob Weinstock, Producer Copyright : ℗ 2016 Concord Music Group, Inc.
John Coltrane, MainArtist - Fred Lacey, ComposerLyricist Copyright : ℗ 2016 Concord Music Group, Inc.
Jule Styne, ComposerLyricist - John Coltrane, MainArtist - Leo Robin, ComposerLyricist Copyright : ℗ 2016 Concord Music Group, Inc.
Count Basie, ComposerLyricist - John Coltrane, MainArtist - Tadd Dameron, ComposerLyricist Copyright : ℗ 2016 Concord Music Group, Inc.
John Coltrane, MainArtist, ComposerLyricist Copyright : ℗ 2016 Concord Music Group, Inc.
John Coltrane, MainArtist - Kenny Burrell, MainArtist, ComposerLyricist Copyright : ℗ 2018 Craft Recordings, a division of Concord Music Group, Inc.
Jerome Kern, Composer - John Coltrane, MainArtist - Oscar Hammerstein II , Author - Kenny Burrell, MainArtist Copyright : ℗ 2018 Craft Recordings, a division of Concord Music Group, Inc.
John Coltrane, MainArtist - Kenny Burrell, MainArtist - Tommy Flanagan, ComposerLyricist Copyright : ℗ 2018 Craft Recordings, a division of Concord Music Group, Inc.
Gus Kahn, ComposerLyricist - John Coltrane, MainArtist - Kenny Burrell, MainArtist - Ted Fiorito, ComposerLyricist Copyright : ℗ 2018 Craft Recordings, a division of Concord Music Group, Inc.
John Coltrane, MainArtist - Howard Dietz, ComposerLyricist - Arthur Schwartz, ComposerLyricist Copyright : ℗ 2016 Concord Music Group, Inc.
Vincent Youmans, ComposerLyricist - John Coltrane, MainArtist - Buddy DeSylva, ComposerLyricist Copyright : ℗ 2016 Concord Music Group, Inc.
John Coltrane, MainArtist - Jackie McLean, ComposerLyricist Copyright : ℗ 2016 Concord Music Group, Inc.
John Coltrane, MainArtist, ComposerLyricist - Bob Weinstock, Producer, Recording Producer Copyright : ℗ 2018 Craft Recordings, a division of Concord Music Group, Inc.
John Coltrane, Tenor Saxophone, MainArtist, AssociatedPerformer, ComposerLyricist - Paul Chambers, Upright Bass, AssociatedPerformer - Donald Byrd, Trumpet, AssociatedPerformer - Art Taylor, Drums, AssociatedPerformer - Red Garland, Piano, AssociatedPerformer Copyright : ℗ 2016 Concord Music Group, Inc.
John Coltrane, Tenor Saxophone, MainArtist, AssociatedPerformer - Oscar Hammerstein II , ComposerLyricist - Sigmund Romberg, ComposerLyricist - Paul Chambers, Upright Bass, AssociatedPerformer - Donald Byrd, Trumpet, AssociatedPerformer - Art Taylor, Drums, AssociatedPerformer - Red Garland, Piano, AssociatedPerformer Copyright : ℗ 2016 Concord Music Group, Inc.
John Coltrane, Tenor Saxophone, MainArtist, AssociatedPerformer - Paul Chambers, Upright Bass, AssociatedPerformer - Donald Byrd, Trumpet, AssociatedPerformer - Art Taylor, Drums, AssociatedPerformer - Red Garland, Piano, AssociatedPerformer - Robert Weinstock, ComposerLyricist Copyright : ℗ 2016 Concord Music Group, Inc.
Richard Rodgers, ComposerLyricist - Lorenz Hart, ComposerLyricist - John Coltrane, Tenor Saxophone, MainArtist, AssociatedPerformer Copyright : ℗ 2016 Concord Music Group, Inc.
Paul Francis Webster, ComposerLyricist - John Coltrane, Tenor Saxophone, MainArtist, AssociatedPerformer - Bronislaw Kaper, ComposerLyricist Copyright : ℗ 2016 Concord Music Group, Inc.
Ray Henderson, ComposerLyricist - John Coltrane, MainArtist - Lew Brown, ComposerLyricist - Buddy DeSylva, ComposerLyricist Copyright : ℗ 2016 Concord Music Group, Inc.
Mack Gordon, ComposerLyricist - John Coltrane, MainArtist - Harry Revel, ComposerLyricist Copyright : ℗ 2016 Concord Music Group, Inc.
John Coltrane, Tenor Saxophone, MainArtist, AssociatedPerformer - HENRY NEMO, ComposerLyricist Copyright : ℗ 2016 Concord Music Group, Inc.
HOAGY CARMICHAEL, ComposerLyricist - John Coltrane, MainArtist Copyright : ℗ 2016 Concord Music Group, Inc.
John Coltrane, MainArtist - Leo Robin, ComposerLyricist - Richard Whiting, ComposerLyricist - Newell Chase, ComposerLyricist Copyright : ℗ 2016 Concord Music Group, Inc.
John Coltrane, Tenor Saxophone, MainArtist, AssociatedPerformer - FRED AHLERT, ComposerLyricist - Roy Turk, ComposerLyricist Copyright : ℗ 2016 Concord Music Group, Inc.
Richard Rodgers, ComposerLyricist - John Coltrane, MainArtist - Oscar Hammerstein II , ComposerLyricist Copyright : ℗ 2018 Craft Recordings, a division of Concord Music Group, Inc.
John Coltrane, MainArtist - Arthur Schwartz, ComposerLyricist - E.Y. HARBURG, ComposerLyricist Copyright : ℗ 2016 Concord Music Group, Inc.
John Coltrane, MainArtist - Sammy Fain, ComposerLyricist - Herb Magidson, ComposerLyricist - Jack Yellen, ComposerLyricist Copyright : ℗ 2016 Concord Music Group, Inc.
John Coltrane, MainArtist - Ary Barroso, ComposerLyricist Copyright : ℗ 2016 Concord Music Group, Inc.
John Coltrane, Composer, MainArtist Copyright : ℗ 2016 Concord Music Group, Inc.
Jule Styne, ComposerLyricist - Sammy Cahn, ComposerLyricist - John Coltrane, MainArtist Copyright : ℗ 2016 Concord Music Group, Inc.
Coltrane inédit, une tuerie !